And she didn’t even use an assault weapon. This is a test to see if you are ticked off today. Are you ticked off yet? I’m betting you will be after reading this. The US has entered into a contract with a real estate firm to sell 56 buildings that currently house U.S. Post Offices. The government has decided it no longer needs these buildings, most of which are located on prime land in towns and cities across the country. The sale of these properties will fetch about $19 billion. A regular real estate commission will be paid to the company that was given the exclusive listing for handling the sales. That company is CBRE and the chairman is a man named Richard Blum. 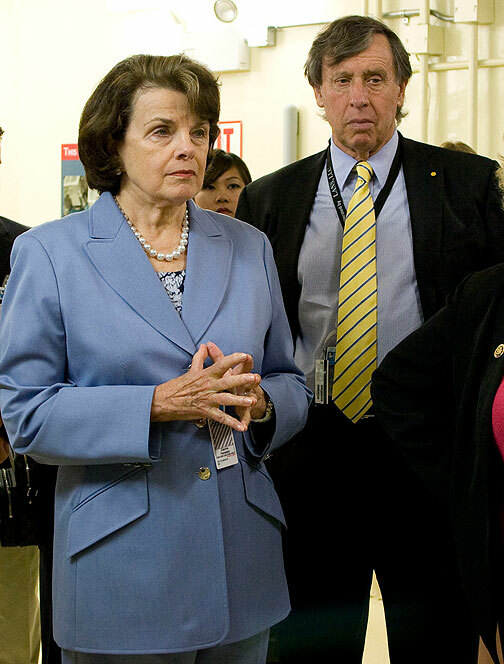 Richard Blum is the husband of Senator Dianne Feinstein and is shown with her in the picture above. (Most voters and many of the government people who approved the deal have not made the connection between the two because they have different last names). Senator Feinstein and her husband stand to make a fortune (EST at between $950 million and $1.1 billion!!) from these transactions. His company is the sole real estate on the sale. CBRE will be making a minimum of 3% and as much as 6% commission on each and every sale. All of the properties that are being sold are all fully paid for. They were purchased with U.S. taxpayers dollars. No one in the mainstream media is even raising an eyebrow over the conflict of interest and on the possibility of corruption on the sale of billions of dollars worth of public assets. How does a U.S. Senator from San Francisco manage to get away with organizing and lobbying such a sweet deal? Has our government become so elitist that they have no fear of oversight? And it’s no mere coincidence that these two public service crooks have different last names; a feeble attempt at avoiding transparency in these type of transactions.